How To: Priyanka Chopra's Glossy Hair And Glossy Skin - A Match Made In Hydration Heaven! Glossy hair and glowing skin are signs of a healthy, happy body. When your hair and skin are hydrated, they look happy, healthy, and glisten and gleam under all the right light! The key to a glossy mane is your hair care and body care regime. If you're wondering why your hair looks lacklustre and skin looks a little sallow, it might be time to make tiny little changes in your lifestyle. It's these small changes that make a big difference to the overall quality of your hair and skin. And, while we may not have access to Priyanka Chopra's hair and skin army, we definitely do have access to the internet. And you know what it tells us? It gives us secrets, solutions, and remedies for absolutely any problem. 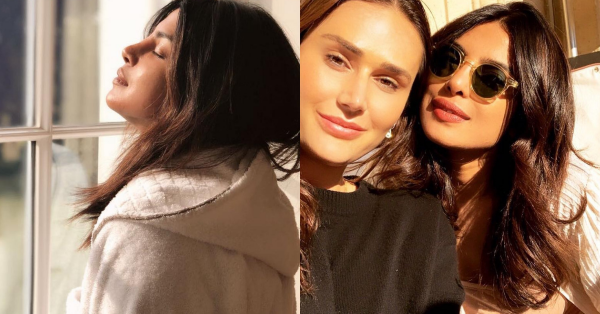 If you're dreaming of glossy hair and glowy skin like Priyanka's there are a few things you can do. Let me give you a quick hint, they all start with hydration. Hydrate, hydrate, hydrate! Inside and out. You want to drink more water, eat healthy, and take those vitamins. When it comes to your beauty regime, you want to make sure you use products that are designed to improve the overall quality of your hair and skin. Here's everything that spells H-Y-D-R-A-T-I-O-N that PC would approve of! To maintain the glossy sheen and health of your hair cuticle, you want to make sure you use a shampoo that's got hydrating properties. The BBLUNT Intense Moisture Shampoo and Moroccanoil Hydrating Shampoo will quickly become some of your favourites. Once you've washed and towel dried your hair, use a nourishing hair serum to prep your hair for any other heat styling. The L'Oreal Absolut Repair Nourishing Serum will mask each strand of hair inside a protective barrier. If you do use any heat styling tools, this step will act as your heat protectant too! You want to make sure you eat healthy, and if you don't, it might help to take some hair vitamins. There are a number of variants from hair gummies - the sweet, chewable vitamins and the more conventional capsules. Those Vitamin E capsules you can buy at your local chemist are highly underrated. You can even use the oil from those Vitamin E capsules on your hair and skin! For radiant glossy skin, hydration is essential. Start by upping your daily water intake and use skincare and makeup products that will help supplement a healthy glow. Use a sheet mask once a week to pamper and nourish your skin. A moisturiser that gives your skin a boost of hydration to last all day like the Neutrogena Hydro Boost Water Gel will make sure your skin retains every bit of luminosity and looks plump and youthful. Before you hit snooze, slather on a hydrating cream like the LANEIGE Water Sleeping Mask to ensure that you wake up to happy, glowing skin.